Malu ‘Aina is by no means a “top-heavy” organization. 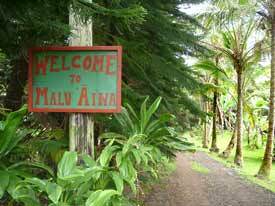 No one at Malu ‘Aina receives salary or wages. We are an all-volunteer community, living simply on catchment water and solar-generated electricity. Life on the farm involves healthy physical labor under basic living conditions. We try to live a life of community service by helping people in need of food, and through our work for peace and social justice. We are interested in people who want to make life changes in this direction. Our primary need is for volunteer physical labor on the farm. Basic jobs include planting, weeding, fertilizing, and harvesting various fruits and vegetables including taro, sweet potatoes, beans, corn, salad greens, bananas, papayas and more. We also raise catfish and tilapia in water catchment tanks. Other tasks include basic building and farm maintenance, the upkeep of peace and justice trails, and some supervision of other volunteers. We are involved in a variety of social issues: anti-war and pro-peace, support of Hawaiian sovereignty, rainforest preservation, opposition to GMO crops, and eucalyptus tree plantations, increasing agricultural self-sufficiency in Hawai’i, respecting Native Hawaiian religious beliefs, sacred sites, traditions, etc. and creating a more just economic order. There are volunteer opportunities for both day workers from the community and resident workers who are ready to make a longer commitment of time. Resident volunteers will be accepted on a one- week probationary basis. 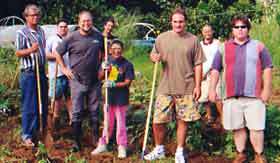 Over the years, Malu ‘Aina has hosted volunteers from across the United States and around the world. They have stayed anywhere from a month to a year. Malu ‘Aina provides room and board along with valuable experience in organic farming, aquaculture and peace and social justice advocacy. However, there is no salary or health insurance. Generally, we work five days a week. Sunday is usually a day of rest. 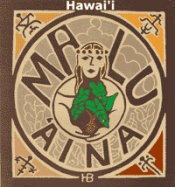 There is a firm policy of no illegal drugs at Malu ‘Aina.